Hi girls! Ready for your Saturday night? I am visiting a friend in half an hour or so, and maybe will go to the city after that. My boyfriend is visiting a concert and might have a drink with his friends afterwards so maybe I'll join! The polish shown today is quite bright for me and I am not sure if I liked this on me or not. Sometimes you just have that feeling with polishes: this has everything I like but somehow I don't feel it. Weird. Anyway, I needed 3 coats for this result and might have used 4 since I still had visible nail line. All polishes from this particular collection seem sheer, the gorgeous Watermelon Rind Loqi showed you needed 4 too! They end result was pretty though so I might wear it again. Do you own anything from the Summer Days collection from China Glaze? I love this collection, though I only have this and Watermelon Rind. I really like how they are almost jellies, but not quite. I actually found Cherry Pie last summer at a supermarket of all places - where I also found a whole bunch of HTF polishes. I still haven't tried this one, but I might break it out on my toes. Wooo I love this!! SO pretty! :D I hope you have a fun night! I don´t own anything from that collection, but this one looks very pretty! Pretty colour! It reminds me of Revlon Watermelon fizz. still pretty" I have Strawberry Fields, Grape Juice & Watermelon Rind. If I don't want to get that thick look Scrangie talks about - I will put down a cream base of the same hue or lighter. It gets rid of the VNL that way but I can see see all the goodies in these great glass fleck looks we love these polishes for. Sometimes on my fingers, I am fine to show a more sheer and not mind the VNL....never on my toes however - I want full coverage and all color to show up. And Aimee Goddard, I do see the Watermelon Fizz in this - might make me use some of these CG from this collection different now as I use all the Revlon Fizz series for toppers. I only wish I had got doubles of every one of those scented Fizzes since I use them so much - esp Pina Colada - they make great toppers when you want a bit of extra but not a full out glitter that is gritty and heavy. i love this!! i've gone back and forth on if i should buy it or not! I'm wearing it on my toes right now :D I love the entire collection, so I have them all! Thanks Amanda, you should look up swatches of the whole collection! Yeah the amount of glassfleck somehow give them another structure. Wow, nice place to score some polish! Wish we would have that here! Thanks Ashesela! I definitely did, my head wasn't thankful the next morning ;). It most definitely is a summer polish! I didn't know that one but it looks like it indeed! Yes they all are jelly like and sheer, but that does help the glassfleck to be beautiful :). 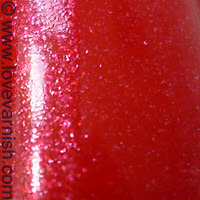 Altough I find Strawberry Fields to have a more creme base! The Revlon polishes sound nice, but isn't the scent weird? If you are in doubt for such a long time it probably means you need it ;)! That must look fierce :D! This is so pretty!! I love the shimmer in it. Just wish it was more opaque. Yes the opaqueness is a thing, but the polish is pretty enough to justify <3.